Wow this is an odd one to preview isn't it? Any other time of the season you'd find it hard to separate these two sides whatever lineups they put out, but even in the patchwork quilt of a competition that is the Guinness Pro 14, this is an unusual situation. The Warriors come to Dublin with only this competition to play for, and they certainly have the right to feel they're in contention to win it all. So their cause would be very much helped by finishing first in Conference A and guaranteeing a home semifinal. 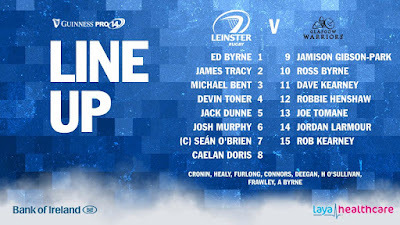 Right now they hold a 3-point edge over Munster in top spot so they know they'll need every point they can get from their remaining two matches, and although the RDS is rarely a good spot to get them, this could be their best ever opportunity. We, on the other hand, are two matches in to a spell of four which I have dubbed our ‘Midseason preseason’ and results wise, it hasn't gone well so far. It certainly hasn't helped that all four opponents are themselves in playoff contention, but still two points from two matches is disappointing for Leinster whatever way you spin it. And with this being the last match on our 2018/19 season ticket, we certainly can't be blamed for expecting a decent performance from the boys in blue, and this certainly looks like a matchday 23 capable of living up to those expectations. 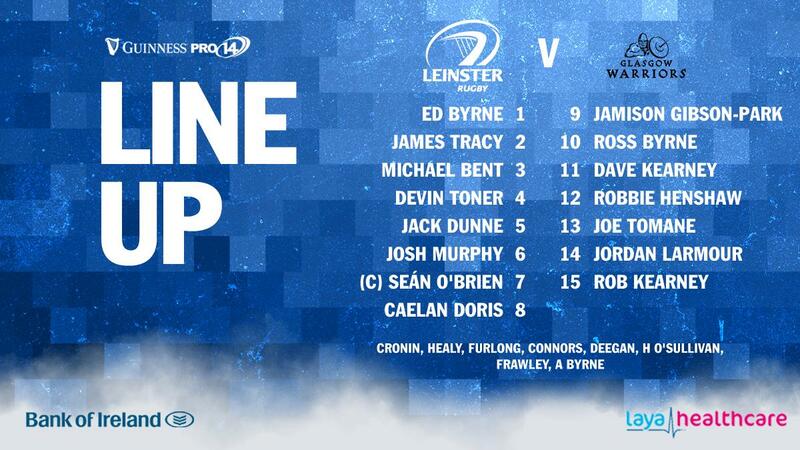 Big standouts on the team sheet are definitely Robbie Henshaw and Devin Toner. Great to see them back in action; of course it's a gamble ahead of the Toulouse semifinal but it's one that's worthwhile all things considered. It's also good to see Ross Byrne back at 10. I had a feeling Frawley might get the nod regardless of who else was available, but that said he did get more game time than planned last week so no harm giving Ross a good run. Sean O’Brien has the captain's armband but it's his playing skills we need most right now with both Leavy and JVDF unavailable; a lot is resting on the Tullow Tank - he'll need both fitness and form at peak levels from now to the end of the season. Joe Tomane gets another run on Saturday, this time at 13. He did well last time out especially defensively and hopefully a repeat performance will get him the recognition he deserves, though he's up against a stronger backline this time around. On the Glasgow side of things, it's hard to miss Stuart Hogg's name, what a perfect time for him to return. He bolsters a stunning back three that includes the slippery Niko Matawalu and the try matching Tommy Seymour. When it comes to the benches, we have our best front row ready to be unleashed in the closing stages, so all going well we will have a lead so they can bring it home. I must admit I was surprised to see the bookies having us favourites by as much as 8 points. I expect the Scots to throw the kitchen sink at us for the first half an hour, and while I do think we'll just about keep them out overall, it should be close throughout so I'm going for a home win by 3-5 points. Replacements 16. Grant Stewart 17. Alex Allan 18. D’Arcy Rae 19. Bruce Flockhart 20. Adam Ashe 21. George Horne 22. Pete Horne 23. Huw Jones.